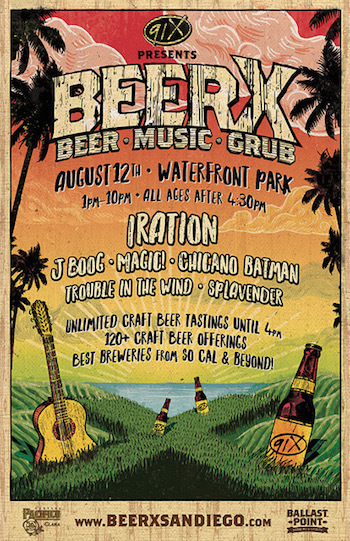 Performance times and an expanded brewery lineup have been announced for the third annual 91X Presents BeerX (Beer • Music • Grub) at scenic Waterfront Park in San Diego, California on Saturday, August 12. Tickets for 91X Presents BeerX are on sale now at www.BeerXSanDiego.com. The festival will feature top reggae, roots and alternative music artists with headliners Iration, as well as J Boog, Chicano Batman, Magic! and San Diego's own Trouble In The Wind and Splavender. In addition, BeerX will offer complimentary craft beer tastings, with an extensive craft beer lineup highlighting some of San Diego and Southern California's top breweries, and local food selections. The complete current brewery list for 91X Presents BeerX includes: Abnormal Beer Co., Acoustic Ales, AleSmith, Alpine Beer Co., Artifex, Avery, Ballast Point, Beachwood Brewing, Booze Brothers, Bottle Logic, Chapman Crafted, Docent Brewing, Fall Brewing, Figueroa Mountain, Green Flash, Groundswell, Hangar 24, Karl Strauss, Latitude 33, Lost Winds, Mad River, Mike Hess, Mikkeller SD, Modern Times, Monkey Paw, Noble Ale Works, Novo Brazil, Ritual Brewing Co., Ska Brewing, Stone Brewing, The Lost Abbey, Thorn St. Brewery, Washington Gold Cider, with more to be announced. During VIP and early entry tastings (from Noon-4:00 PM), and general admission tastings (from 1:00 PM-4:00 PM), 91X Presents BeerX attendees 21+ will enjoy unlimited craft beer samples from top breweries. Local food trucks and pop-up restaurants will also be on site selling a variety of delicious and unique food options throughout the day and evening. Craft beer and other libations will be available for purchase at concession stands as well. 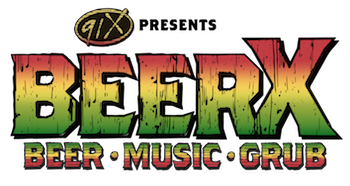 91X Presents BeerX is produced by premier music festival production company Synergy Global Entertainment (SGE) and Orange County, California's most successful and respected craft beer festival producer, Brew Ha Ha Productions. BeerX sponsors include Pacifico, Corona, Ballast Point, and more.